This photograph shows the period of full suspension during a gallop, when all four of a horse’s feet are off the ground at the same time. You can see an animated gif of the full sequence of photos made of this galloping racing mare, Annie G., here. This particular image was first published in 1887. For literally hundreds of years, horsepeople argued about whether or not all of a horse’s feet were ever off the ground at once during a gallop. In 1872, Leland Stanford, a wealthy railroad tycoon who bred racing Standardbreds (and would eventually found Stanford University), decided the newest methods of photography could settle the question. So he hired Eadweard Muybridge to figure out a way to record galloping horse movements that were simply too fast for a human eye to follow. Six years later, on June 19, 1878, Muybridge did it. Stanford’s mare “Sallie Gardner” was recorded running down the Palo Alto track by a series of twelve cameras with string-triggered shutters. And in several of those images, all four of her feet were gathered beneath her, none touching the ground. Her body was flying mid-air in what’s since been designated the suspension phase of the gallop. You can see an animated gif of another galloping sequence Muybridge made a few years later by clicking the still image to the left, which was published in 1887. 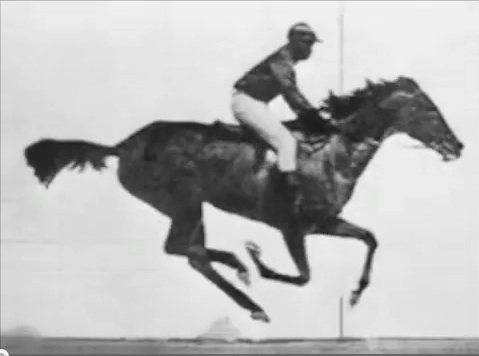 Muybridge’s high-speed, sequential photographs set the stage for real motion pictures, and are arguably one of the first scientific observations of horse movement. They still show us new things today, helping us understand more about horse movement and encouraging us to take a second and even third look at what it is these amazing animals are really doing. But even with modern motion pictures, high-resolution photography, and high-tech methods for analyzing force and stress, horsepeople are still arguing about how horses move and what that means to our riding or driving them. What are gaits? What is collection? How heavy a rider can a horse safely carry? Should a horse wear shoes or is barefoot a better option? Even basic good riding is increasingly linked to a sound understanding of how horses move. “Riding with feel” is central to the work of many outstanding trainers and clinicians, including Ray Hunt, Paul Belasik, and Sally Swift. But how can a rider understand and move with a horse’s own natural movements when most people can’t access reliable information about how horses really move? In addition, most riders don’t realize that the concept of feel was originally borrowed from Indigenous culture. So how can riders in mainstream culture understand and apply a concept that draws from a worldview that’s literally foreign to them? Gaining a deep appreciation for, and connection with, the ways that both horses and humans stand and move provides a bridge for authentic learning that can help riders finally attain genuine Feel: an applied understanding for how horses move, and how they — as a rider — can move with the horse. We know what kinds of questions you have about horse biomechanics because they’re the ones you ask at our seminars and clinics, or when we’re draped side by side over a fence rail watching horses play, or when we’re just talking together over coffee. 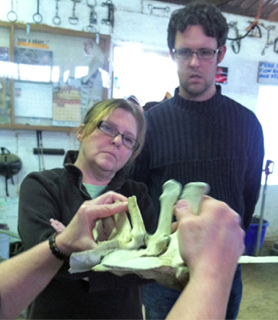 We know you want to learn horse biomechanics, and we know why — because you’ve told us. We know that some of the books and resources already available work for you but leave you with unresolved questions, and that others leave you feeling puzzled or confused — or even left out if you don’t ride dressage. Because yes, most available books about horse biomechanics focus on how it applies to principles of dressage — and that’s fine. But it doesn’t mean, as some publishers apparently think, that only dressage riders care about horse biomechanics. We’ve learned that you cowhorse people want to understand the biomechanics of how your horse moves, and so do you gaited horse riders, thoroughbred racehorse breeders, endurance riders, eventers, and hackney pony drivers, to name just a few. We know you are eager to learn horse biomechanics whether you’re riding in a barn, an arena, a back yard, on trails in big city parks or across miles of open country. We know that thoroughbred racing organizations care about biomechanics: they pay for much of the basic horse biomechanics research that’s carried out in the U.S. and Great Britain. And we know that of course dressage riders want to learn biomechanics: they’re turning to it to resolve questions that will define their changing discipline for years to come. We also know that horsepeople care about Feel and understand how vitally important it is to good horsemanship — but that it remains an elusive, poorly-understood, and largely inarticulated concept in mainstream horse publications and clinical settings. And we know why that’s so. Feel can be experienced, but it can’t be fully understood or explained outside of Indigenous worldview. Through a series of exploratory clinics and seminars, we’ve learned how to integrate a basic understanding of horse biomechanics with basic concepts of Indigenous worldview to create a bridge that can help riders of the mainstream culture finally understand and develop the skill of riding with Feel. That’s good for people. And it’s even better for the horses they ride. Originally, we planned for the focus of this book to be strictly mainstream science and horsemanship skills. But the processes of presenting our seminars and preparing this book taught us that it’s simply not possible to teach what we’re trying to teach — that we believe most people want to learn — outside the context of Indigenous worldview. Although this book is being prepared through Understanding the Horse LLC, a partnership created by Dawn Adams and Jo Belasco for the purpose of offering horse-related educational materials and programs to the general public, Dawn and Jo are also co-presidents of Tapestry Institute, a non-profit research and education organization Dawn founded in 1998. (Dawn is a registered member of the Choctaw Nation of Oklahoma.) Tapestry operates within Indigenous worldview, and its Horse-Human Relationship Program founded by Jo in 2001 approaches the horse-human relationship within Indigenous principles of reciprocity and relationship. Bringing the book within Indigenous worldview allows us to more successfully address the basic concept of Feel so that members of the mainstream equestrian community can really start to understand it. A parade at the Kentucky Horse Park celebrates just some of the wonderful diversity of horses, riders, and riding styles. “The Science of Riding with Feel: Horse Biomechanics and You” is for the whole horse community.